Tagged Dave Frohnmayer: UO President, Randy Geller General Counsel, Sharon Rudnick. Bookmark the permalink. Typical Bill Harbaugh distortions. You assert that this is a “special deal for Frohnmayer and Rudnick,” when in fact the rule change has nothing to do with Frohnmayer or Rudnick or HLGR. It may affect HLGR in the future–or it may not–but to characterize OUS’s rule as a “special” deal “for” them is plainly dishonest. I’ve added a few more documents and links to show a bit more about the extent of the special relationship between UO and its General Counsel Randy Geller, HLGR, and Frohnmayer and Rudnick. of Seychelles Beckham, a Why is this of import? You are wrong about literally everything you wrote in this post. The problem is that you know nothing about the law, and you are a fool, so you don’t actually realize when you’ve said something stupid, and it is impossible to convince you of that fact. The other problem, Bill, is that you are also a selfish and dishonest person, so you reflexively and unjustly attribute selfishness, dishonesty, and other bad motives to people. As a consequence, you slander and denigrate people who are better human beings than you. Thanks “Roger”. Frohnmayer sure has some interesting friends. When a turd like “Roger” floats to the surface and tells you you’re a bad person, you know you got the gist of it right. “His” IP address would probably be comical. My legal case (for ORICO-Racketeering, et. al.) 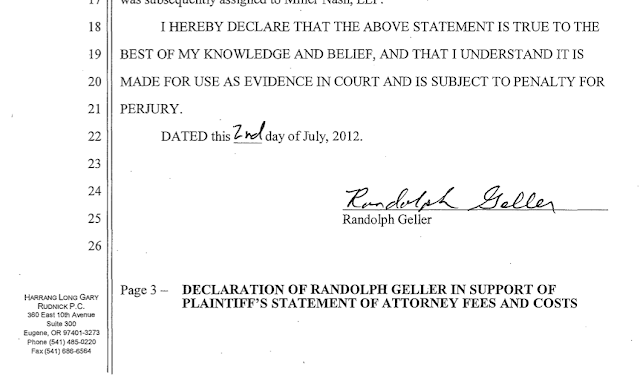 against the UO is cited in one of Geller’s briefs. Apparently, UO had wanted to use HLGR, but instead was forced to use Hershner Hunter instead. My case against the UO was partially settled last year. But, there are still a few loose ends. I was informed about two weeks ago that HLGR was taking over from Hershner Hunter (despite Hershner Hunter representing UO for over a year and a half) on the case. I’m intentionally not trying to “spin” anything here. Those are simply the facts.